Great Smoky Mountains Railroad will delight passengers who take the memorable one-hour journey to an imaginary North Pole. The event is inspired by the Warner Bros. motion picture and the award winning book by Chris Van Allsburg. Bring the whole family and experience the magic of THE POLAR EXPRESS and read along with the story as the train makes its round trip journey to the North Pole. 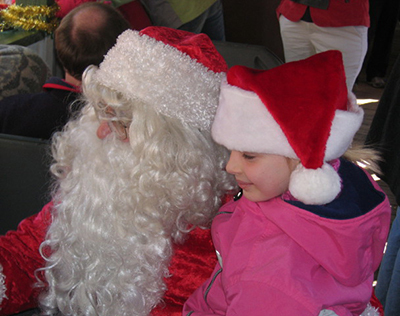 Meet Santa and enjoy caroling, hot cocoa & a treat. And, for those who BELIEVE, a special momento from Santa for each child. Children are encouraged to wear their pajamas! Family First Class Seating – Guests will receive a deluxe serving of hot chocolate in a souvenir Polar Express mug, and enjoy short breads and other treats in addition to the standard offerings and a special momento from Santa. Adults $59, Children ages 2-12 $41. Children under 2 $10 (no mug). Crown Class Seating – Guests will receive a deluxe serving of hot chocolate in a souvenir Polar Express tumbler and a special momento from Santa. Adults $49, Children ages 2-12 $36. Children under 2 $10 (no tumbler). Coach Class Seating – Guests will receive a serving of hot chocolate and a special momento from Santa. Adults $39, Children ages 2-12 $26. Children under 2 ride complimentary, but must be seated in an adult’s lap. Premium rates may apply to select dates. For more information and reservations please call (800)872.4681 or visit us online at http://www.GSMR.com. All Christmas Eve Limited passengers will receive an exclusive souvenir Golden Ticket necklace lanyard and a special momento from Santa. Family First Class Seating – Guests will receive an exclusive souvenir Golden Ticket Necklace Lanyard, a deluxe serving of hot chocolate in a souvenir Polar Express mug, and enjoy short breads and other treats in addition to the standard offerings and a special momento from Santa. Standard Seating – Guests will receive an exclusive souvenir Golden Ticket Necklace Lanyard, a serving of hot chocolate and a special momento from Santa. Adults $50, Children $37. Children under 2 ride complimentary, but must be seated in an adult’s lap. Premium rates may apply to select dates. 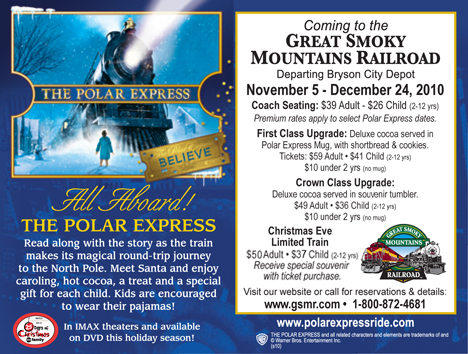 Visitors who ride aboard The Polar Express™ Train Ride will also receive FREE admission to the Smoky Mountain Trains Museum. Without train excursion admission is $9 for adults and $5 for children. For more information and reservations please call (800)872.4681. “All Aboard” says the conductor, as your train ride begins. Families are sure to enjoy their trip to the North Pole, complete with cocoa and cookies served on board the train, followed by a reading of The Polar Express™ by Chris Van Allsburg. Upon arrival at the North Pole, Santa will greet the children and each child will receive their own jingle bell, just like in the story. There will be caroling on board the train as your trip returns to the depot. This is a holiday ride the entire family will enjoy. Ticket prices start at $38.00 for adults and $26.00 for children ages 2-12. Children under two years old ride complimentary, but must be seated in an adult’s lap. Premium rates may apply to select dates. For more information and reservations please call 800-872-4681 or visit us online at www.GSMR.com. First Class seating upgrades are available. Each first class guest will receive a deluxe serving of hot chocolate in a souvenir Polar Express mug, and enjoy short breads and other treats in addition to the standard offerings. First Class fares are $57.00 for adults and $40.00 for children ages 2-12. Children under two years old are $10.00.